"My hope is to bring to life the elements of grace, beauty, spirit and freedom that horses possess." My lifelong love of horses is what drives and inspires my art. I'm fascinated by the grace, beauty, spirit, power, and freedom horses possess. My hope is to bring to life these elements in my work. Horses seem to inspires us, as humans, to dream. As an artist, I revel in trying to capture those dreams in three dimensional form. 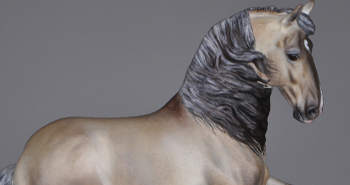 With over 20 years of experience I hope that my work shows my knowledge of equine conformation and biomechanics as well as proper colors represented in appropriate breed types. For example knowing that Sabino will look different on a Clydesdale vs. another breed is important when going for accuracy. I pride myself on this knowledge along with my attention to detail. Each of my pieces is represented with as much accuracy as I can manage. 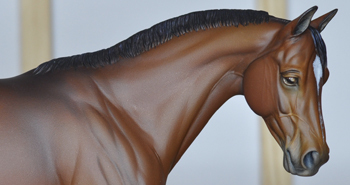 I also enjoy adding as much detail as possible from detailing muzzle with shading and whisker bumps, teeth that are dirty and worn like a real horse, eyes that sparkle and tell a story, ears that show mood, hooves worn with dirt or show ready, chestnuts that look real, and multi colored and detailed manes and tails. My work is considered top LSQ with many NAN grands and reserves, as well as top tens. I had so much fun creating this guy! He was a commission piece the owner wanted to be Sabino. Sabino in the Criollo breed expresses itself quite differently. It required a lot of research and then many hours painting each individual hair in the correct direction to match his hair pattern. This sculpture is supurb in detail, correctness and emotion! It captures a playful moment in time and suspends it for all eternity. I have tried to replicate the emotion of the sculpture with the paint job. This sculpture is also full of life and emotion. Just look at thos twitchy lips! 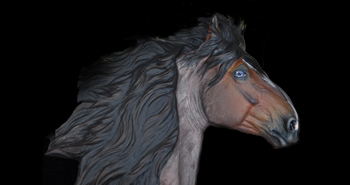 I truly enjoyed bringing this horse to life with a soft dun color.